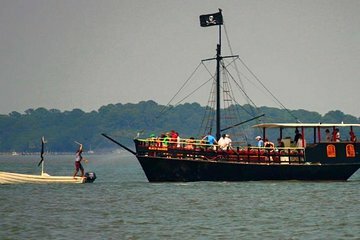 Make your own way to the pier in Harbour Town for your pirate cruise from Hilton Head island. Before boarding the pirate ship, the crew provides the kids with costume gear, face paint, and temporary tattoos for an authentic pirate look, along with a pirate name, and a lesson on walking and talking like a pirate. When ready, step aboard the ship and sail the seas in search of the treasure chest. In order to find the treasure, kids read the map and help to defeat a rival pirate named Stinky Pete, unleashing the water cannons in the process. All of the pirates get a share of the loot to take home after beating Stinky Pete and getting to the treasure. The cruise runs for almost two hours, and runs several times in the morning and afternoon. This was a great experience! We have 4 kids, 17, 14, 10 and 4. We did this for the 10 and 4 year old and they had an absolute blast! Our 4 year old brings up the experience and talks about how much fun she had! The 17 and 14 year old enjoyed watching all the fun, they found it as fun and my husband and I did. I would highly encourage you to take your children on this excursion, it is well worth it.